Mpow has really stepped up their packaging game recently. The last few set of headsets that I have received some come in a really nice, spiffy looking box. The Mpow Seashell Bluetooth Headset came in one of those said boxes. The design of the box is pretty cool. The box opens up from the side and once opened, reveals the headphones. There are also hidden magnetic strips on the flap of the box where you open it and on the side of the box. This is great since this assures that the box stays closed when the flap is closed. I absolutely love this! The next thing that hit me like a ton of bricks was the green color. Mpow seems to favor this neon/lime green color. And it works for them too. 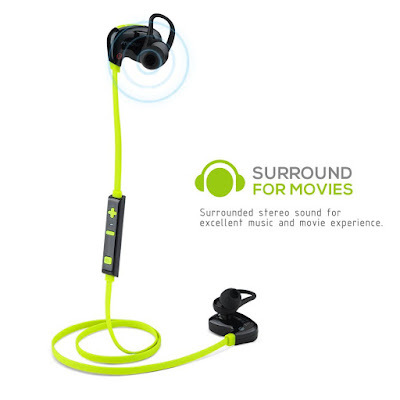 This neon green type color is super popular among runners, gym rats, and all around active people so the Seashell headphones scream active lifestyle. Even the buttons on the control bar match the color of the headphones (more on the control bar below). The earpieces are shaped a little weird... but then again... 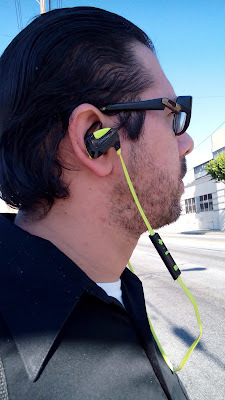 I said the same thing about the Mpow Swift headphones and they turned out to be great. The Mpow Seashell has a more rectangular shape to them and is, again, a unique design choice. The wire seemed a little weird to me too. Instead of a rounded wire, the Seashell headphones is designed with a flat wire. I'm so used to seeing round wires and braided wires that this flat wire just seemed a little odd. Maybe there is a purpose for it being flat or maybe it was just a design choice. Either way, the flat wire did catch my attention and thought I would mention it. The headphones are placed in an awesome felt tray looks really, really good in the box. I just hope they sound as good as it initially looks. You can pull the felt tray out of the box and underneath it you'll find the USB cable and the rubber ear pieces. I like this idea of a "hidden compartment" to hold all of the earpieces and USB cable. Nice. Now... time to plug them in and give them a try. So I pulled the Mpow Seashell Bluetooth Headset out from the felt tray and plugged them in to charge. The charging port is on one of the earpieces and I was really glad to see that the flap covering the port was real easy to open. Based on previous experiences, some of those flaps had been nearly impossible to open without claws so it was a real delight that this flap was super easy to open. Also, the ear stabilizers are real easy to switch out. The ear piece has a large enough space for the ear stabilizers that when you have them on, it feels like that they are securely in place. You have the option of rounded stabilizers or the curved stabilizers. I prefer the curved ones. I just feel that they flow better and fit better with your outer ear. Now... I wasn't a fan of the stabilizers at first. This was because I found them pointless, but I wouldn't be doing my job if I didn't at least try them on. Now, I absolutely love them. I felt that it would be weird to have them, I thought they were bulky and stupid looking, but after giving them a shot, I've come to learn that they simply enhance your headphone wearing experience. If you ever wore in ear headphone pieces that would always seem fall out of your ear, it's because you were not using the stabilizers. So once the stabilizers are on, I gave these bad boys a go. Connecting the Mpow Seashell Bluetooth Headphones was fairly easy and standard stuff. You pretty hold the on button on the control bar for a few seconds to get the headphones to go into pairing mode. Once in pairing mode, turn on the bluetooth on your bluetooth enabled device and look for Mpow Seashell. Once again, you have to give props to Mpow for actually displaying the name of the device during the bluetooth search because I simply hate it when there is a random string of letters and numbers that represent your device. This makes it extremely easy to identify the Mpow headphones and connect to them in a breeze. Once connected, the headphones will remember the last device that it connected to so next time around, you won't have to pair them anymore and the headset will automatically connect when the device is in bluetooth mode. Again, extremely easy stuff. As for the range, 30 feet is the standard distance for Bluetooth headphones and this falls within that 30 to 35 feet range. I pretty much just left my device in one room and walked as far away as possible with the headphones on before I lost connection. Simply walking back within range will allow the headphones to automatically connect to your device. I really love the sound quality of the Mpow Seashell Bluetooth Headset. The HD sound here is no joke. I believe that the noise cancelling technology and the AptX HD sound tech combined to create one awesome listening experience. I was extremely happy with how crisp the sound is. You can easily submerse yourself in a whole new world of sound with these headphones. Yes, friends... they are that good. Going through my normal gauntlet of music, I found that all sound checks passed my tests. The highs were crisp, the mids were not muddy, and the lows... my gosh... the lows were exceptional. You get a real nice "thump" from the bass sound with these headphones. Maybe the shape of the earpiece has something to do with that? I don't know for sure, but whatever it is... it is doing an excellent job of pounding out the bass sound! After going through hours of music, I fired up a movie and some TV shows to get another sound check. To no surprise, the excellent sound quality continued. Voices were crisp, background sounds came in clear, music was spot on. The HD sound quality that these headphones boasts do not disappoint. It's surprising to me how you can get such full sound from such a small earpiece. Now, the control bar. The control bar is no more than 4 inches away from the left ear piece. I've found that 4 inches is essentially the "sweet spot" for the control bar. It's close enough to speak into (for call functions) and just far enough to reach comfortably with your right hand. The control bar has a fairly simple design to it. It has 3 buttons, the plus, the minus, and the on button. I did find it interesting that Mpow decided to actually have the "+" and "-" symbols as the buttons as opposed to circular button with these symbols on them. It's universally known that + is to turn up the volume while - is to turn down the volume. Honestly, I'm not a huge fan of this design choice. It seems almost a little too childish or goofy. While I'm all for a little bit of childish and goody stuff, I just don't think that the design of the buttons work here. I dialed up a few buddies on Skype to get a good grasp of just how well the call functionality works on the Mpow Seashell Bluetooth Headset. Based on my prior experience with these headphones, I knew that the sound quality would be good, but I wanted to test out that microphone. I'm not the biggest of fans of headphones having calling capabilities but I find that it's becoming more a standard feature more and more these days so I need to get used to the fact that calls are a thing. lol Anyways, microphone was good, call quality was good, everything sounded great... while inside. While trying to use the microphone outside... it was a different story. You need to speak more clearly and some wind noise could be heard. Not a deal breaker in the slightest bit, if you ask me. Now the battery is life pretty good. From what I've seen, about 5 hours is now the standard battery life of a set of bluetooth headphones. The Mpow Seashell rocks out for a good 7 hours before it needs a recharge. Not too shabby. Perfect for those long commutes or when you know you're not going to be able to get a charge in for a long while. The longer they can last on a single charge, the better. The only thing that was a bit of a downer here is that it took almost 3 hours to charge from dead to 100%. That seemed like a pretty slow charge to me. Those 5 hour headphones would charge up in about 2 hours... so I guess another hour of charge will get you 2 more with the Seashells. I guess that's a good trade off. So there you have it, my experience and review of the Mpow Seashell Bluetooth Headset. 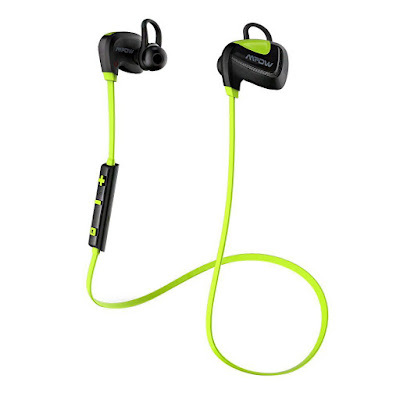 The sound quality is top notch, they are extremely easy to use, they have a long battery life, and they are super sporty. And after some continue use, I think I may have found out why the wire is flat... It's to reduce the chance of the headphones getting tangled up! Not once have they tangled up on me and getting headphones tangled up is common among those with a round wire. Nice job, Mpow! The only thing that I can complain about is some of the design choices. I'm not a big fan of the + and - symbol buttons and that rectangular ear piece is still a ways from growing on me. But other than that, you are getting exceptional sound quality from this headset! If you are active, if you travel a lot, if you have a long commute, you cannot go wrong with this headset. You can get yours now on Amazon for under $30! Pick one up today before they sell out.